Steve and Dave Lee, founders of International Podcast Day, joined MacKenzie to discuss the 5th annual celebration, occurring on September 30th. A day dedicated to the power of podcasting for not only creators but listeners and enthusiasts, Blubrry is participating in two different sessions dedicated to teaching podcast practices. Before they delve into the celebration they spoke of some recent changes in the podcasting industry. Slate’s Panoply network announced they’ll no longer be releasing new content, instead focusing on advertising. iHeartMedia purchased StuffMedia for 55 million dollars and Buzzfeed cut it’s podcast department and subsequently some of it’s staff. These changes won’t have an effect on the majority of the podcasting industry but they represent a bigger systematic evolution. The abandonment can seem to outweigh the recognition and movement forward, especially all in one week, but overall this is all part of how a medium grows. 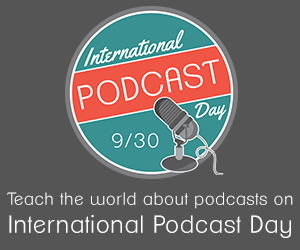 International Podcast Day actually starts on September 29th to accommodate for part of the day on different countries all over the world; about 30 hours of content will be provided. The schedule can be found on the site and be sure to check out sessions times for things you want to learn and hear about. We’re thrilled to be taking part and that Todd Cochrane’s Podcast Awards are included. Thanks for listening and please subscribe via your favorite podcast app. If you’d like to be a guest on the show reach out to MacKenzie. She’s always looking for fun, new podcasters that use Blubrry services, specifically PowerPress. Fan of PowerPress? Leave us a review here! iHeartMedia Purchases StuffMedia: The network responsible for Stuff You Should Know, Atlanta Monster, Required Listening and more. Podcasting Shakeup: Panoply parts ways with content creation. Buzzfeed Shutting Down Podcasts: Focusing more exclusively on video and longer-form projects.